Director of the de Young and the Legion of Honor, John Buchanan, brings the fabulous work of John Baldessari to San Francisco. The print retrospective includes over 100 prints that span the four decades of Baldessari’s post-painting period, 1970s to the present. 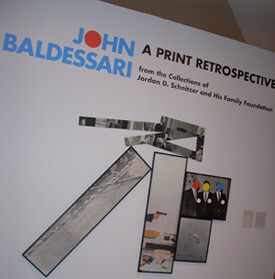 Jordan D. Schnitzer, a prodigious collector based in Portland, Oregon has loaned his nearly complete archive of Baldessari’s printed work to the Legion of Honor. 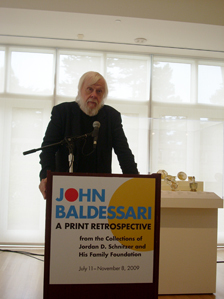 He is truly impassioned by Baldessari’s work and his ardent speech moved me to my core. His fervor created a mounting sense of anticipation as I waited to move into the galleries to see the exhibit—I was not disappointed. As I walked through the exhibit on a tour led by John Baldessari himself I was intrigued by his completely unconventional artistry. His prints challenge viewers to break their conventions about almost every aspect of what we have traditionally deemed makes art aesthetically pleasing: the dimensions, rectangular shape, color palette, and concepts of beauty. 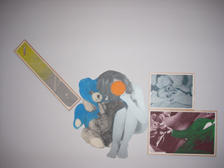 Baldessari’s fascinating style of printmaking involves appropriating photographic images and text with his signature colorful cutouts and creating collage-esque compositions. 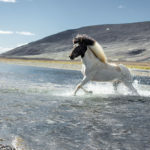 In this he challenges our tendency to prioritize certain parts of an image, particularly the face, and charges us to focus on other parts of the image. When asked about the significance of covering faces with colored circles, Baldessari replied that with his artwork he is trying to illustrate “how we view the world and prioritize our vision. 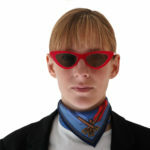 In my work I found that I could be the master of my own universe and control what people see and pay attention to,” which once again echoes the narrative motif of Baldessari’s prints. This is an exhibition not to be missed and one which encompasses the history of this incredible artist’s printmaking. If you’re looking to be intellectually and artistically stimulated, then John Baldessari’s collection will most definitely deliver. There is a quiet, subtle beauty about this man’s work which he says is completely unintentional. “Each time an artist does something they get better at creating beauty—so why work at it,” John Baldessari.